1. Automatic pellet packing machine has the advantages of high calculating precision, stable function, digital demonstration and easy operation. 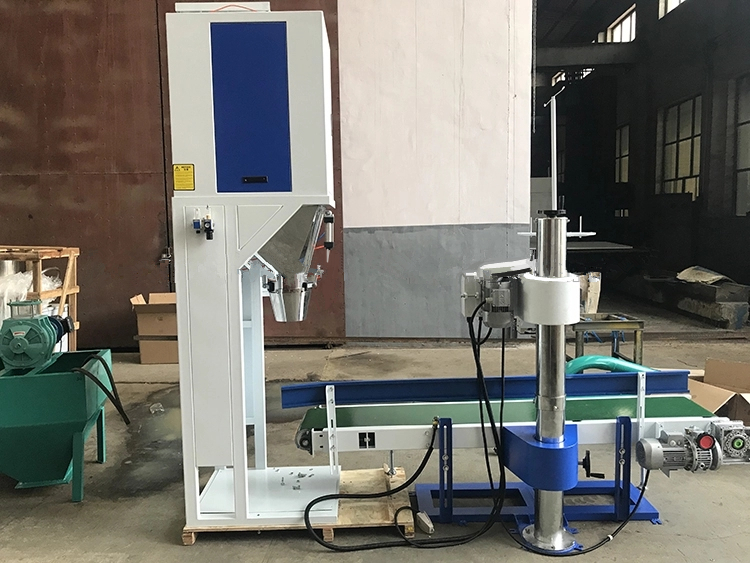 2.Equipping the computerized control software, the feed pellet weighing and packing machine is available for control data setting,drop height auto-repairing, fault auto-detection. 3. Adopting the duple weigher working system. The two weigher can work synchronous or individual, which improves the working efficiency of the feed weighing and packing machine. the automatic feed pellet packing machine is new developed packing machine,it adopts the advanced computerized automation & control technology-technician. It is mainly used for weighing and packing feed pellets in feed pellet line to save labor force. Commonly, the automatic feed pellet packing machine is always combined with the transport belt and the sewing machine ,which can constitute the automatic feed pellet weighing and packing system used in animal feed factories. The automatic pellet weighing packing machine is suitable for large and medium sized feed pellet production plants. feed pellet packing machine is always applied to a automatic weighing and packing system, combined with the transport mechanism and the sewing machine. The automatic feed pellet weighing packing machine has a widely application ,such as feed pellets, wood pellets, grain,fertilizer granules and other particle material and powder material with good fluidity. With an excellent performance, it has been adopted by a great many large feed pellet production factories. 1.The feed pellet weighing packing machine reserves communication interface, whole machine can implement the digital connection with the upper machine in the feed pellet production line. 2.Automatic pellet packing machine has the advantages of high calculating precision, stable function, digital demonstration and easy operation. 3.Equipping the computerized control software, the feed pellet weighing and packing machine is available for control data setting,drop height auto-repairing, fault auto-detection. 4.Adopting the duple weigher working system. The two weigher can work synchronous or individual, which improves the working efficiency of the feed weighing and packing machine. 5.Using the international advanced sensor and the pneumatic actuators, the feed pellet weighing and packing machine works reliably, with no pollution. 6.The out surface applies the plastic spraying technics besides the inner surface applies the advanced stainless steel material, against rusting and corrosion thus prolonging the service life of the machine.